Characterized by fuzzy skin and a large seed or pit in the middle, peaches are a deliciously unique fruit which offers a a wealth of health benefits. You can find peach trees in nearly all temperate countries now, but they are native to North-West China, near the Kunlun Shan mountains. They received their name Prunus persica from their voyage to Persia, where they were cultivated on their eventual journey to Europe. Now, you can find them in grocery stores and farmer’s markets all over the world. Because they are loaded with vitamin C, peaches can also aid in the battle against cancer. Vitamin C is a strong antioxidant known to have anti-cancer properties. Specifically, the antioxidant fights against free-radicals which are known to cause cancer. 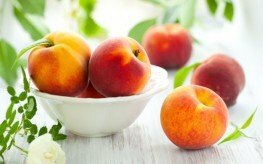 Another Texas A&M study revealed that peach extracts were able to kill the most aggressive breast cancer cells in a lab without harming healthy cells. Vitamin C is also responsible for the skin protecting benefits of peaches. Whether eaten or applied topically, vitamin C can help form collagen, reduce wrinkles, and fight sun-related skin damage. The fiber within peaches is also responsible for health benefits. Research shows diabetics who consume diets high in fiber have lower blood glucose levels. With 2 grams of fiber, the average peach is definitely part of a healthy, high fiber diet. Further, high fiber diets are also known to lessen the risk of colon cancer. When it comes to heart disease, peaches can be a part of a preventative diet as well. A good source of potassium, peaches can assist in heart disease prevention along with other fruits and vegetables. Fresh peaches are the best, chosen in summer at the peak of the season. But if you can’t get fresh and locally grown peaches, opt for frozen rather than those canned in a heavy syrup. If you want to capture the best peach flavor year-round, try canning your own in a simple syrup made with water and honey.